The film opened with a deadly accident within Jurassic Park during the movement of a vicious creature - a velociraptor - from its heavily-fortified cage. The spectacular park was located on the secluded island of Isla Nublar 120 miles west off the coast of Costa Rica. Its wealthy entrepreneur and InGen Corporation CEO John Hammond (Richard Attenborough) faced a $20 million lawsuit unless the park was given an on-site inspection and all-clear before its imminent opening - he needed "outside opinions" from reputable individuals "to sign off on the park." Hammond helicoptered them to the biological preserve, where they boarded jeeps for a tour. The group first observed a sick Triceratops, and saw how the animals were held back by electrified fences with 10,000 volts. Things went awry during the tour when a tropical storm struck, and in a sub-plot - the park's greedy, financially-strapped, obese, slovenly and greedy computer programmer Dennis Nedry (Wayne Knight), who had been bribed for $1.5 million by rival geneticist Lewis Dodgson (Cameron Thor), sabotaged the security system (shutting off electrical fencing) while stealing valuable frozen, viable dinosaur embryos (hidden in a shaving cream can). This led to a chain reaction of events including the scary breakout of the giant ferocious, carnivorous Tyrannosaurus Rex (computer-generated and modeled), which attacked the tour cars and devoured Gennaro cowering in a toilet. Out in the rain in his crashed Jeep, Nedry was killed by a head-finned, stalking, venom-spitting Dilosophorus, while Dr. Grant saved the Murphy grandchildren but was forced to sleep with them in a tree. Authoritative security chief and game warden Robert Muldoon (Bob Peck) and Ellie rescued the wounded Malcolm, although their Jeep was chased by the ominous T-Rex ("You think they'll have that on the tour? ", he quipped). By the next day, Grant and the two grandchildren were caught up in a Gallimimus stampede followed by a hungry T-Rex, and the fast-moving, dangerous, 6 foot tall, razor-clawed Velociraptors (or simply raptors) had escaped from their electrified fencing when the security system was shutdown and rebooted. 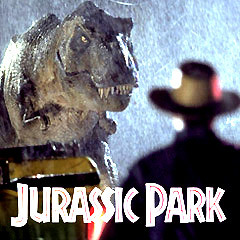 The park's chief engineer Ray Arnold (Samuel L. Jackson) was killed by an escaped raptor in the utility shed when manually resetting the electrical breakers, while outdoors, Muldoon who had sensed: "We're being hunted," was killed by another raptor. The two grandchildren were cornered in the kitchen by a pair of raptors, and were able to lock one in a freezer. In a climactic scene set in the Visitor's Center amidst fossil/skeleton displays, the T-Rex suddenly attacked the raptors, saving the remaining group from being eaten. The film ended with Grant telling Hammond: "I've decided not to endorse your park" as the survivors boarded an InGen escape helicopter and flew off. Based upon the novel by Michael Crichton. Nominated for three Academy Awards (with three wins): Best Visual Effects, Best Sound, Best Sound Editing. As of the end of 2017, it was the only film in the series franchise to have won Oscars. With an initial production budget of $63 million, the film grossed $357 million (domestic) and $915 million (worldwide). It became the top-grossing (domestic) film of the year, easily beating out the # 2 film Mrs. Doubtfire (1993) at $219 million, and the # 3 film The Fugitive (1993) at $184 million. It was noted for its full-motion, computer-generated (CGI) dinosaurs created at George Lucas' ILM facility. The dinosaurs were very realistically-rendered and seamlessly integrated within live-action sequences. There were 14 minutes of dinosaur footage in the movie, with only four of those minutes generated by computers. DTS Digital Sound also made its theatrical debut in the film. On its 20th anniversary, the film was re-released in 3-D and IMAX in 2013. It opened above the previous year's Titanic 3-D (at $17.3 million), coming in at $18.6 million. Universal Studios spent only $10 million to convert the film to 3-D.
Set-pieces: the Gallimimus stampede scene, the first T-Rex attack on the two tour vans, the stalking in the kitchen, the finale in the Visitor's Center.